Size: Sizes from 800 x 1200mm to 1800 x 1600mm. Screensorption_Plus are lower budget, freestanding acoustic office screens designed to be adaptable and flexible in any noisy office environment. Designed to reduce sound yet remain aesthetically pleasing. These acoustic screens are designed to help block and absorb noise in noisy workstations such as busy offices and call centres. Can be supplied as desk mounted or floor standing in glazed or curved finish. They are available as desk mounted or floor standing and can be linked together to form a continuous acoustic screen or as 90 deg. angles for corners of desks and rooms. 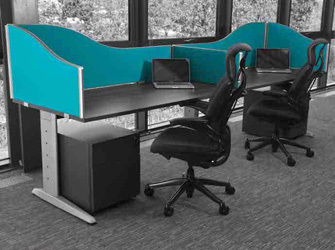 A range of sizes and colours are available with straight or curved tops, flat or wavy panels. Standard Screensorption acoustic screens are produced with a flame resistant fabric covering a layer of sound absorbing foam and are nom. 25mm thick. They are constructed to give good sound absorption properties and are light enough to easily install into most office environments. The higher specification screens have a thicker non-flammable sound absorbing foam infill and are nom. 49mm thick. A wide range of acoustic screen fabric colours are available as can be seen from our Colour Chart and edging trims and posts are silver coated plastic. Other finishes of Black, Light grey, dark grey and brown are also available for a small increase in price. Screens can be supplied in an wide configuration of widths and heights to suit your specific building and furniture requirements up to a maximum of 1800mm high by 1600mm wide. The nominal thickness of the screens varies from 25mm to 49mm for the higher level acoustic screens depending on what is required. Note! This product is produced according to the customer’s required dimensions and colour chosen from our range. Because this product is tailored to customers requirements, we cannot accept any returns unless proved to be faulty.